But then I saw the playsets, which contained out-of-scale creatures, as well as vehicles and props that aren’t even in the film, and I got the impression that this was actually an, ahem, ‘unofficial’ range, put together from trailer images and someone’s idea of what might be in the movie. So I filed the whole lot, Kong included, under ‘nah’ and put them out of my mind. However, a few days ago, for reasons I’ve already forgotten, I started looking online at the Kong toy again. And as one unboxing video led to another, I got quite excited by what I saw. Close up, the figure’s face impressed me, and the reviewers all seemed pleased with their purchases. Had I been hasty in my dismissal? 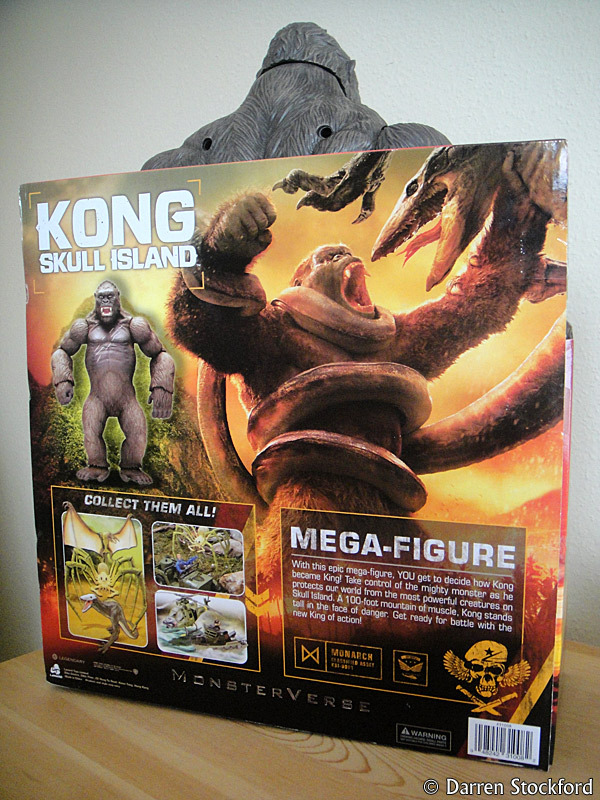 Delving deeper, I discovered that Kong and the related playsets are official. Lanard, a toy company based in Hong Kong, hold the licence, and stock is available from just one UK chain, Smyths (with Walmart having exclusivity in the US). So after searching for the nearest branch, I set off with my wallet in my hand and hope in my heart. Would this Kong live up to my growing expectations? Despite knowing the toy’s height (18 inches), I was gobsmacked by his size when I saw him, on a thankfully low shelf. Photos and videos hadn’t done him justice. His presence in real life felt much greater than in any image I’d seen – even the ones with objects or people in the frame. He looked magnificent: it was the full-body reveal from the film all over again. And at that moment, I knew I had to have him. So like the middle-aged collector fusspot that I am, I set about inspecting the paint jobs on every Kong in the shop, lest I got him home to find that his eyes weren’t looking in the same direction. A couple of hours later, and £29.99 lighter, I was back at home and attempting to free the beast from his cardboard lair – a three-minute extraction that involved snipping a few cable ties, slicing every bit of Sellotape I could see, folding the box flat, and removing a small screw. This screw left a hole in Kong, slightly to the left of his spine. However, it’s the least of his back problems. Four much larger wounds – deep channels for screws fixing the back half of his torso to the front – mark his shoulder blades. And there are another two near his shins. As well as spoiling the rear view, that’s gotta hurt, even for a 100ft ape with little fear of heavy artillery. Thankfully, the front of the toy has no such issues. The points of articulation are obvious, especially in the forearms, but as these serve a greater purpose than simply holding the toy together they’re easy to see past. The shoulders, elbows, hands, feet and head are all jointed, though the degrees to which they move vary. The head swivels a little, the hands swivel a little more, and the feet both swivel and tilt. The arm joints allow for the most movement, but some joints are stiffer than others – straight out of the packaging, anyway. There’s no articulation at all in the legs, but I’m betting there’s a good reason for that. With Kong’s lower half in a fixed position and his centre of gravity low, it’s hard for him to topple over. Even with outstretched arms, he remains rooted to the spot – unless, of course, you give him a nudge. At 1.6kg, he’s a reasonably heavy figure – to the point where I feel like I have to lift him around the waist with two hands – and if he fell off a table or shelf he’d land with some force. So the trade-off between movability and stability was, I think, one worth making. Kong is a well built toy and has an impressive heft to him. However, in certain respects he feels a bit delicate too. While his head, hands and feet are made from a firm, rubbery plastic, his body and arms are hard but hollow, and I wonder how they’d fare if accidentally dropped on to a hard surface. Also, the 7mm-thick joint in the middle of each arm feels like a weak point when I’m posing the figure, so I’ve not been pushing it too hard. If I broke this ape I’d be a broken man. 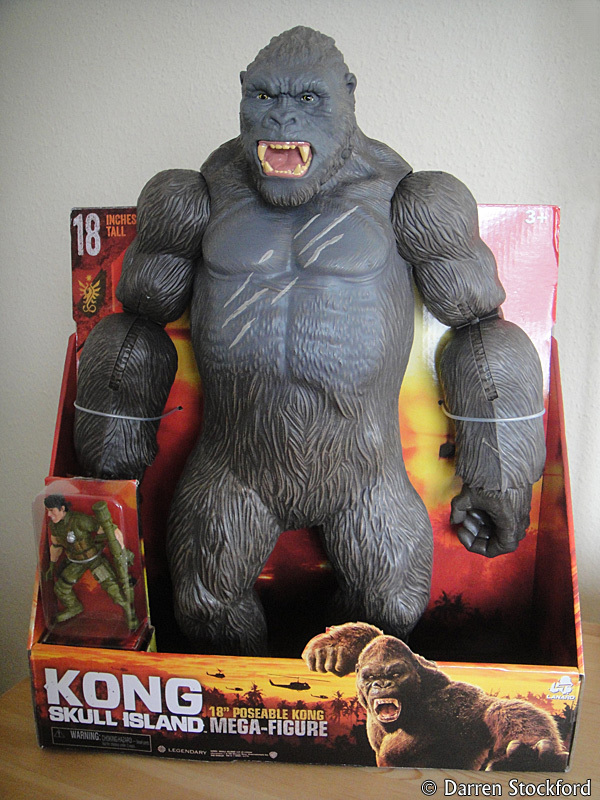 Packaged alongside Kong is an unnamed soldier whose likeness doesn’t match any of the film’s characters. His arms swing at the shoulders and his head turns, but his legs are static. As with the figures in the playsets, he’s out of scale with Kong – who in this film is much, much taller than any previous version – but if you don’t mind that, I guess he’s an okay bonus. I do mind, so I’ll be popping him in a drawer and forgetting about him. Sorry, fella. The soldier and the playsets make it clear that this Kong: Skull Island range is meant to be about play first and foremost. These products are toys, not collectables, so I’m happy to give the centrepiece some leeway on screen accuracy. 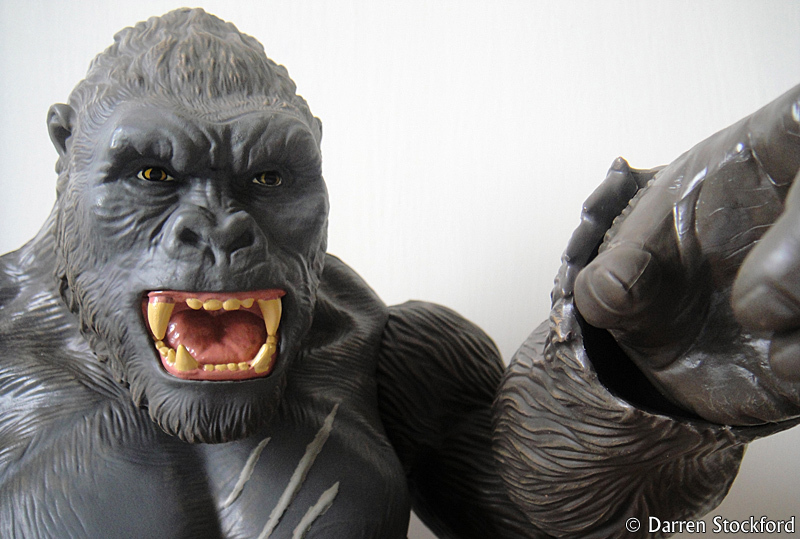 Though Kong is well painted, ideally his colouring would be darker. I’ve seen some great custom paint jobs from fans that have gone down this route, and it was actually something I thought about trying myself, before I saw the figure in real life, where the colours looked darker than the images I’d seen online. I’m happy enough – and a bit wary of mucking things up, to be honest. Still, as the customisers have proved, there’s room for improvement in this area if you’re so inclined. 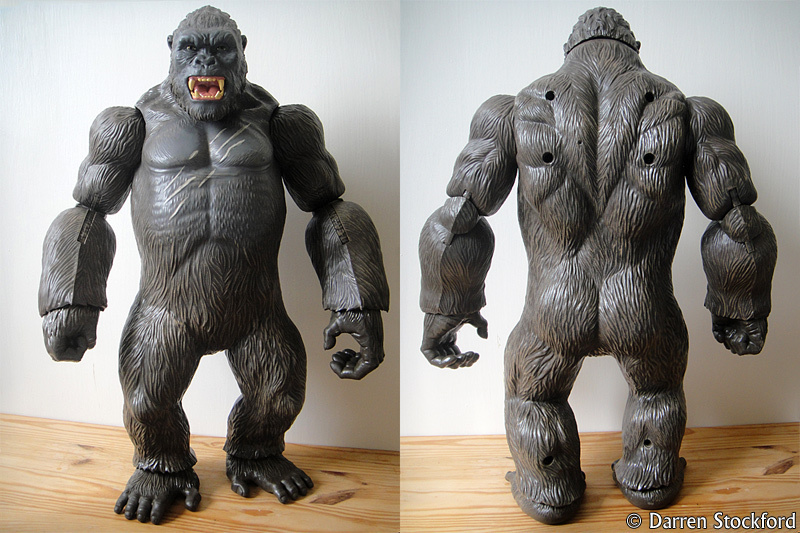 Seams are visible, but the sculpt is well detailed and Kong’s proportions are pretty close to the character we see on screen. The forearms are perhaps a bit too big, and the ‘pinch’ into the articulation doesn’t help with this, but the figure carries their size pretty well. The best feature, though, is the face, which is just knockout. Full of character, it captures the look and spirit of the titular beast perfectly: fearsome but, well, kind of friendly too, if you treat him right. Or maybe that’s just me projecting. In summary, this figure has its flaws but I adore it. If you’re a fan of Kong: Skull Island and you like getting tactile with movies, this is a must-own piece of merchandise – though I think it has the potential to excite lovers of any of Kong’s incarnations, really, due to the ‘classic’ feel of its design. The only problem might be storage. This Kong is one of the biggest toys I’ve ever owned. He’s certainly the biggest character of any sort. 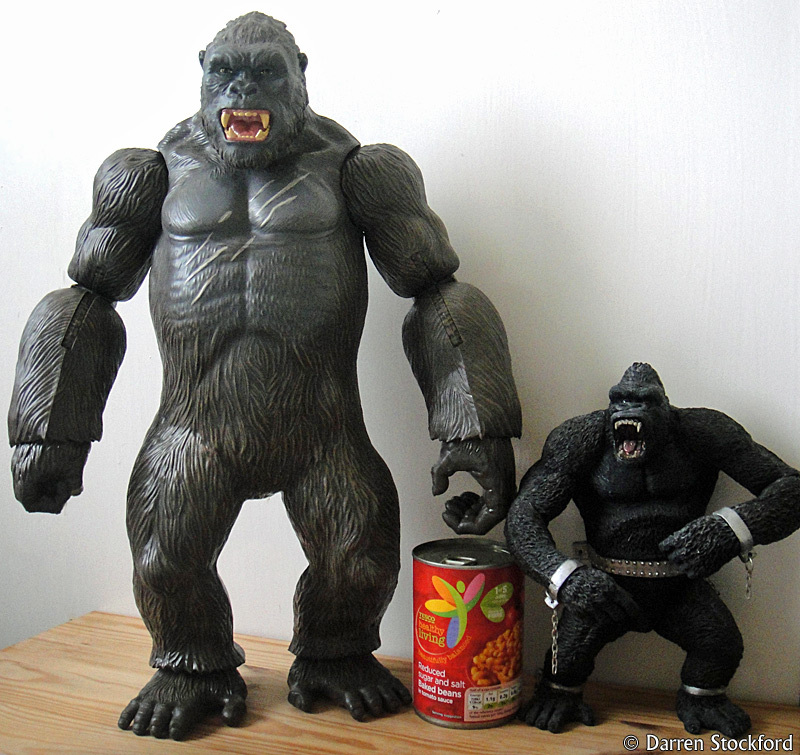 The picture above shows him alongside McFarlane’s Kong ’33 figure, which I’ve never thought was small, and a can of baked beans because everybody knows the size of those. I’ve been running out of space for a while now. However, I’ve managed to clear a shelf for my Kong, even if he hasn’t spent much time there yet. For the past few days, as I’m still in the “I can’t believe I own this!” stage, I’ve been standing him out in the open, on the floor next to my TV’s subwoofer. When I turn the light off at night, and the figure turns into a shadowy homunculus, I half expect him to start walking towards me, beating his chest. And I love that.